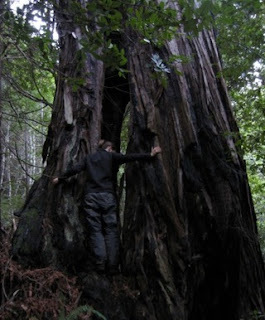 Humboldt Redwood Company to log trees up to 65” dbh near the Headwaters Forest Reserve. This THP is just north of the Headwaters Forest Reserve and about 5 miles SE of Eureka, CA at an elevation of 200 to 700 feet. Humboldt Redwood Company is planning a group selection and selection (individual tree removal) tractor and cable logging operation on steep and unstable slopes in redwood and Douglas fir forests. There are 128 acres of late seral stands in the THP area including trees up to 40" dbh in unit 1 that could be logged, trees up to 50" dbh in units 3 & 5 that could be logged, and trees up to 65" dbh in units 2 & 4 that could be logged. The THP area flows into the Lower North Fork of the Elk River which is listed as an impaired watershed for sediment and siltation. 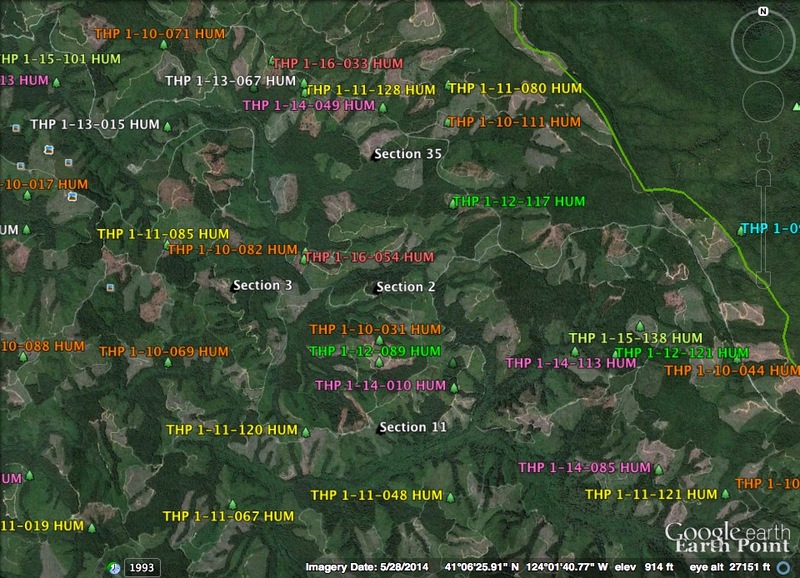 Eleven landslide terrain sites are located within the THP area including debris slides, disrupted ground, debris flows and cut bank failures. Humboldt Redwood Company is planning to use ground based equipment in areas designated for cable logging in units 2 and 5, and construct a short segment of road inside a class I (year round) watercourse at Dunlap Gulch and the North Fork of Elk River. They also want to construct steep segments of road U11.40001 on slopes over 65% grade, and within 100 feet of a class I watercourse. 33 road drainage sites are planned for work including rocking, dip construction, ditch cleaning and culvert repair/replacement. There are 2 historic osprey nesting trees, and 9 spotted owl nesting territories within 1.3 miles of the THP area. 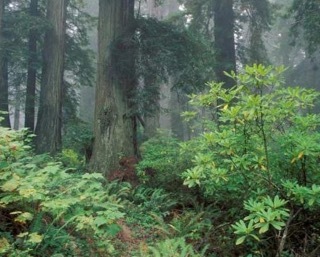 Green Diamond Resource Company to clearcut log SW of Redwood National Park. This THP is about 5 miles NE of Trinidad, CA and about 2 miles SW of Redwood National Park at an elevation of 600 to 1,080 feet. Green Diamond Resource Company is planning a mostly clearcut tractor and cable logging operation on steep and unstable slopes in redwood and Douglas fir forests. There is an unstable area along the eastern boundary of unit A, and a seep that concentrates water across a road causing outboard fill erosion. Potential marbled murrelet habitat exists within .25 mi of the LP Mil Road, and there is an osprey nest within .25 mi of the LP Mil Road, and 2 osprey nests within .25 mi of the BL2000 Road. Red tree voles were reported in 1994 to be in unit C. There are spotted owl nesting territories within .5 miles of unit E.
Mendocino Redwood Company to log on steep and unstable slopes between Elk and Philo. 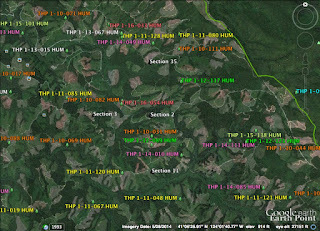 This THP is about 6 miles SE of Elk, CA, and about 7 miles NW of Philo, CA at an elevation of 450 to 1,460 feet. Mendocino Redwood Company is planning a tractor and cable logging operation on steep and unstable slopes in redwood, Douglas fir and grand fir forests. There are 7 landslide terrain sites including steep headwall swales, debris flows, earth flows and disrupted ground. 51 road drainage sites are planned for work including rocking, dip construction, ditch cleaning, culvert repair/replacement and restoration of washed out crossings. There is marbled murrelet habitat adjacent to the THP area. Two spotted owl nesting territories are located within .7 miles of the THP area. 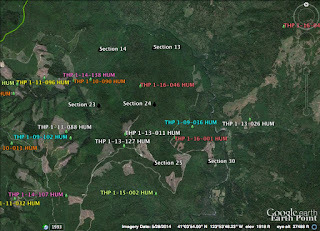 Sierra Pacific Industries to clearcut log trees up to 40” dbh near Weavervile, CA. This THP is about 6 miles SW of Weavervile, CA and Highway 299 at an elevation of 1,840 to 3,960 feet. Sierra Pacific Industries is planning a clearcut tractor and cable logging operation in Douglas fir, ponderosa pine, sugar pine and incense cedar forests. The THP area flows into the Trinity River which is listed as an impaired watershed for sediment and siltation. Sierra Pacific Industries is planning to use ground based equipment on steep slopes up to 65% grade to construct fire lines. 12 road drainage sites are planned for work including rocking, dip construction, ditch cleaning, and culvert repair/replacement. There is an active osprey nest in section 30, within 170 feet of a haul road and within 300 feet of Soldier Creek Road. 3 Spotted owl nesting territories are located within 1.3 miles of the THP area, and within .5 mi of units 103 and 201. Humboldt Redwood Company to log trees up to 55” dbh just south of Avenue of Giants. This THP is a mile south of the Avenue of the Giants and Highway 101 and about 4 miles SE of Scotia, CA. Humboldt Redwood Company is planning a tractor and cable logging operation on steep and unstable slopes in redwood, Douglas fir and grand fir forests at an elevation of 150 to 2,350 feet. The THP area flows into the Eel River which is listed as impaired watershed for sediment and temperature. The THP area contains trees up to 55" dbh, and will allow for the logging inside large tree marbled murrelet stands 307C, 319C and 320C. There are multiple landslide terrain sites including debris slides, debris flows, earth flows, rock slides and disrupted ground. 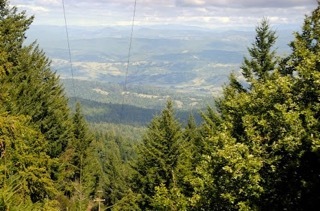 Humboldt Redwood Company is planning to use ground based equipment in areas designated for cable logging. 7 road drainage sites are planned for work including rocking, dip construction, culvert repair/replacement and restoration of washed out crossings/sinkholes. There are 3 Cooper's hawk nests in unit 4, and eight spotted owl nesting territories within 1.3 miles of the THP area. 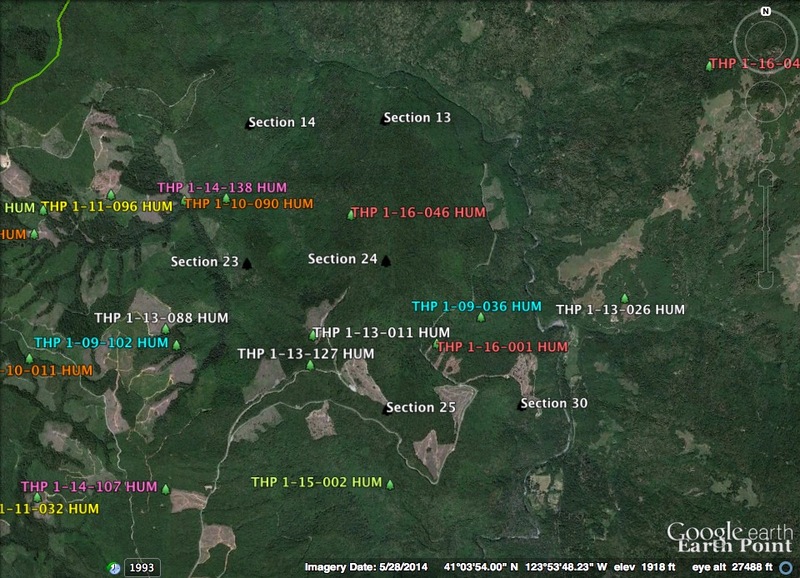 Green Diamond Resource Company to log east of Trinidad, CA. This THP is about a dozen miles east of Trinidad, CA and a few miles SE of Redwood National Park at an elevation of 500 to 1,800 feet. 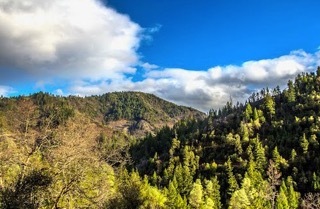 Green Diamond Resource Company is planning a tractor and cable logging operation on steep and unstable slopes in redwood, Douglas fir and western hemlock forests. 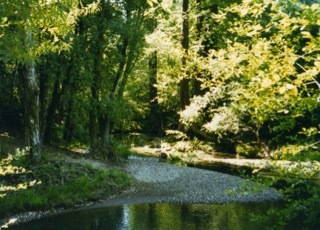 The THP area flows into Redwood Creek which is listed as an impaired watershed for sediment and temperature. There are dormant landslide terrain sites in units A, B and C. Ten road drainage sites are planned for work including rocking, dip construction, ditch cleaning, culvert repair/replacement and restoration of washed out crossings and sink holes. There are spotted owl nesting territories within .5 miles of units A and D.